YAY! 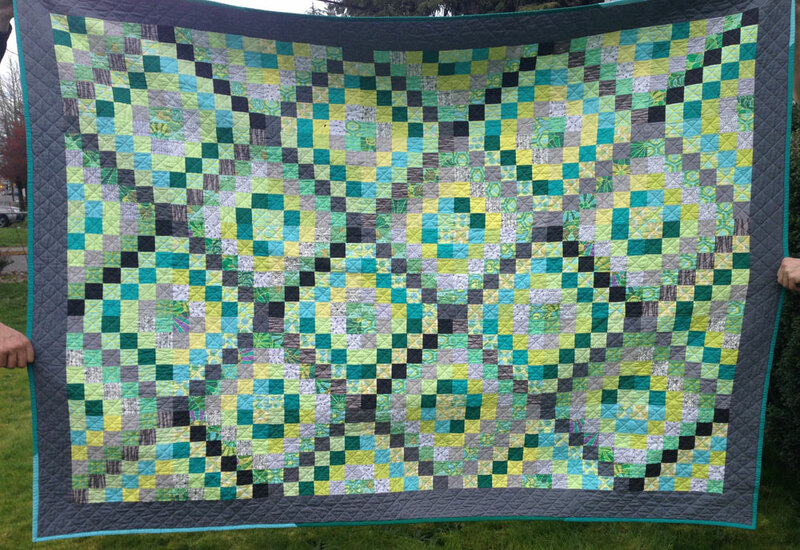 I finished the quilt I made for my friends 50th Birthday, and he now has the quilt so now I can speak and share freely! He was totally surprised and happy with it, and it really made me happy being able to make it for him. Giving is always such a good feeling, and I don’t get to do it as often as I’d like. 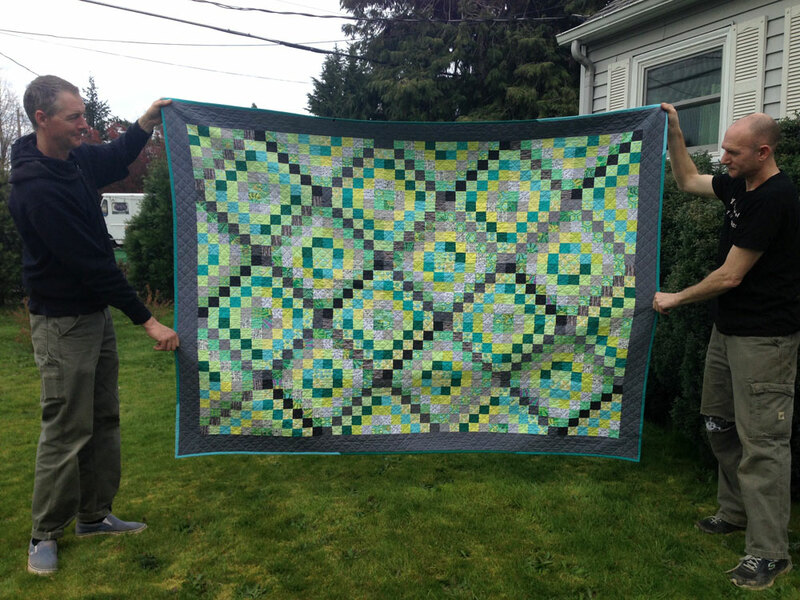 I made the quilt to be 68″ x 96″ for my friend (pictured on left) – I wanted it to be long enough for him to sleep with – being tall has challenges! 😉 I’m a little bummed I won’t be able to show it at quilt guild, but I’m happy I was able to give it to him on his birthday! I used the Trip Around The World block, and named it “50 Trips Around The Sun” which I thought was pretty punny! I used a piece of Kaffe Fassett fabric as my focus fabric to choose the other colors. I wanted it to ‘sparkle’ so I used different shades of solid grey and blues, and yellow-greens. I LOVE how it turned out! This is my scrappy back – I didn’t have too many scraps for this one so I used an Allison Glass piece that I adore along with this quilt back with “love and blessings” and poetry written all over it. It was perfect for my friend. I used wool batting and did straight lines on the diagonal for quilting. I quilted it on my Juki, and it came out great! I have a long list of people I’d love to make a quilt for… but the next one will be another ‘healing quilt’ – or a quilt that I make purely for my own need to cleanse and express. I’m starting to think I should go to school to be a counselor and then use quilting as an art therapy. It’s helping me so much in these very dark times. Speaking of healing… I’ve been on a new health regimen that hopefully will bring me closer to being healthy. I was diagnosed with SIBO a few years back and did a couple rounds of heavy antibiotics to treat it, but they did not work. I’ve adjusted my diet to deal with this, but things have been getting worse, so I took charge and bought a whole bunch of necessary suppliments and am on a Low FODMAP/SCD diet for the next 3 weeks. I really hope this will help. My nausea keeps me from doing so much. 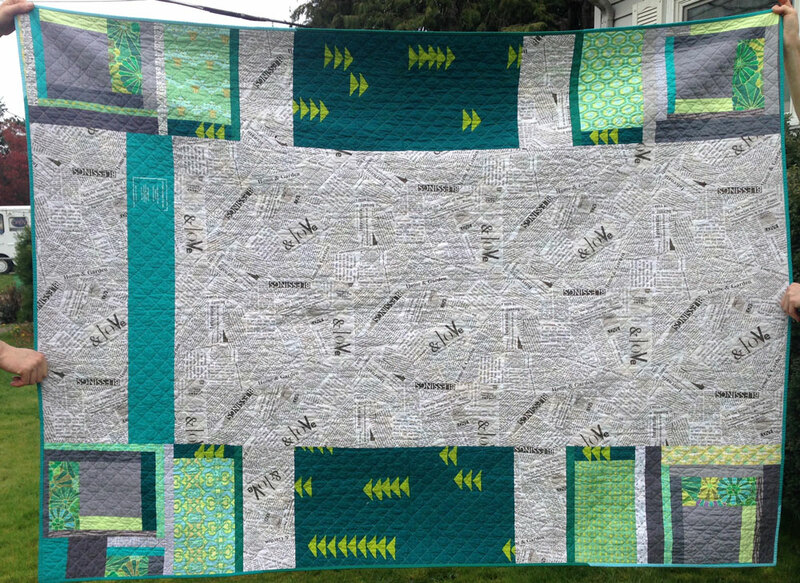 I just saw that Craftsy is having a quilt designer fellowship contest – if you win they set you up with a new sewing machine and a booth at Quilt Market, which would be my dream… if I didn’t get so sick every time I travel. I get sick just going out to eat, I don’t know how I can try any new directions in life until this is figured out. I feel so held back it’s frustrating. I’m lucky that I work at home with my husband who takes care of me when I need it. I really don’t think a job would let me sit in the bathroom for half the day… or would be so lenient when my brain fog causes me to check out completely. It’s almost like having an autoimmune disease… the kind you can’t see. I don’t look sick, just pregnant (swollen belly from SIBO) and full of acne due to my lack of liver enzymes. However, sometimes I feel like all I want to do is lie down (where ever that may be) from being SO exhausted, sometimes I get nauseas from the most simple things like air fresheners and detergents (definitely from things like shoes/tires/carpets/plastics/perfumes/colognes/anything scented), sometimes I get so swollen my skin itches, or my tongue swells up and it’s hard to talk, my ears ring constantly and loudly -to the point it’s hard to hear anything else, and my head is usually pounding. Plus every joint aches almost all the time. If I happen to eat something ‘bad’… it all goes South from there… think food poisoning – full on with fever sweats – that lasts 2-6 days. t’s beautiful, Gail! And I absolutely love what you did on the back! Ha ha… even thought they are a bit of a pain, I love a pieced back – thanks so much Dawn! Thanks too for further info about your illness. My brother has Crohn’s and I know from that that intestinal problems and the fallout can be hell. I hope your new plan is working.